Qosina offers a variety of valves that are in stock and ready for immediate delivery. Qosina part # 80036 is a visual flow indicator, ideal for oxygen tubing delivery systems. 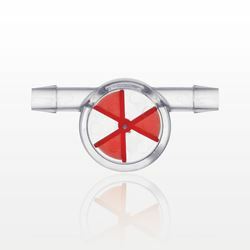 Made of acrylic and polypropylene, this valve's red wheel spins when flow is present, providing immediate indication of fluid or gas flow, and it's barbed inlet and outlet can accept 1/4 inch to 5/16 inch ID tubes. Qosina offers a variety of oxygen bushings and respiratory accessories to complement this barbed flow indicator. Qosina offers a variety of valves that are in stock and ready for immediate delivery. 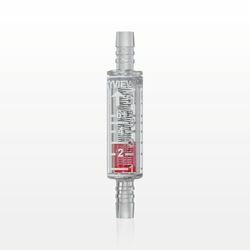 The Oxy-View™, Qosina part # 11067, is an in-line flow meter- made of polycarbonate, polystyrene and stainless steel, and is designed for use with oxygen cylinders, concentrators and other oxygen delivery systems. When connected to oxygen bushings within an oxygen line, this unique indicator measures the flow rate of oxygen from 0-6 liters/minute and works in any position. Qosina offers a variety of oxygen bushings and respiratory accessories to complement the Oxy-View™.